Our guide to San Diego will help you find the best budget hotels in San Diego California. Although San Diego is the eighth largest city in the country, it's stayed true to its laidback surfer vibe mentality. If you're looking for trendy boutique hotels, an exploding culinary scene, and big-city nightlife, with a side of beach bum mixed in, you're in the right place! For families, San Diego is ideal. If world-famous destinations like the San Diego Zoo, SeaWorld, Belmont Amusement Park, and LegoLand (in nearby Carlsbad) aren't enough, families can take advantage of an abundance of museums, a children's theater, a puppet theater, and all sorts of other, lesser-known but no less entertaining attractions. With this much to offer, it's no surprise that tourism plays a major role in San Diego's economy. Other big contributors include biotechnology, agriculture, manufacturing, and defense-related industries. The US Marines and the US Navy maintain several bases in the county. There are tons of great budget hotels in the city of San Diego, our city guide will help you find the best budget hotels. You may have a hard time deciding what to do in San Diego, but we make your decision easy. 11025 Vis Sorrento Pkwy, (858) 523-0500 - Homewood Suites San Diego-Del Mar is a budget hotel / motel / resort located in San Diego CA. 12032 Scripps Highlands Dr, (858) 635-5723 - SpringHill Suites San Diego Rancho Bernardo/Scripps Poway is a budget hotel / motel / resort located in San Diego CA. 1546 2nd Ave, (619) 236-9292 - Motel 6 is a budget hotel / motel / resort located in San Diego CA. 17240 Bernardo Ctr Dr, (858) 676-1660 - Hilton Garden Inn San Diego is a budget hotel / motel / resort located in San Diego CA. 1865 Hotel Cir S, (619) 881-3600 - Residence Inn San Diego Mission Valley is a budget hotel / motel / resort located in San Diego CA. 1955 San Diego Ave, (619) 543-1130 - Comfort Inn Airport at Old Town is a budget hotel / motel / resort located in San Diego CA. 2051 Shelter Island Dr, (619) 222-0561 - Best Western Island Palms Hotel & Marina is a budget hotel / motel / resort located in San Diego CA. 2296 Niels Bohr Ct, (877) 863-4780 - Holiday Inn Express Hotel & Suites San Diego Mesa is a budget hotel / motel / resort located in San Diego CA. 2380 Moore St, (619) 291-9100 - La Quinta Inn San Diego Old Town is a budget hotel / motel / resort located in San Diego CA. 2485 Hotel Cir Pl, (800) 433-0437 - Comfort Inn & Suites Zoo Sea World Area is a budget hotel / motel / resort located in San Diego CA. 3860 Murphy Cyn Rd, (858) 292-8927 - Extended Stay America is a budget hotel / motel / resort located in San Diego CA. 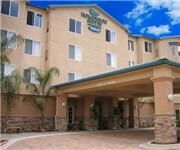 3888 Greenwood St, (619) 299-6633 - Hampton Inn is a budget hotel / motel / resort located in San Diego CA. 4041 Harney St, (619) 298-4771 - Best Western Hacienda Hotel Old Town is a budget hotel / motel / resort located in San Diego CA. 411 Hotel Cir S, (619) 291-1300 - Best Western Seven Seas is a budget hotel / motel / resort located in San Diego CA. 4540 Mission Bay Dr, (858) 274-7888 - Comfort Inn Mission Bay Sea World Area is a budget hotel / motel / resort located in San Diego CA. There are plenty more budget hotels in San Diego. See all budget hotels in San Diego California.